Liduvina Marie Quintana Lozano, of Truth or Consequences, passed away peacefully at her home on July 14, 2018 with her daughter by her side. 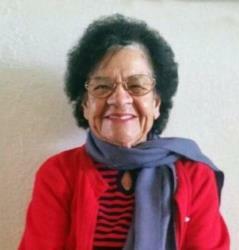 Liduvina “Vina” Marie Quintana Lozano was born October 29, 1928, at Hurley, New Mexico at 6:30 PM. Vina graduated to be in the presence of the Lord as she stepped into eternity as God’s gracious and merciful hand was there to receive her on Saturday, July 14, 2018 at 4:30 AM. She was 89 years old at her passing. Vina lived an amazing and incredible life with lots of adventure as she and the love of her life, Henry C. Lozano Sr., were married on December 19, 1947. They enjoyed 61 incredible years of marriage. In August 2000, Vina celebrated her husband’s baptism as she too rededicated her life to the Lord. Vina was preceded in death by her husband as he went to be with the Lord on April 12, 2009, on Easter Sunday. Vina was blessed to have a great husband who provided for her family, so she could remain home and raise her four children. She was a dedicated and loving Mom who was very proud of her children, grandchildren, great grandchildren, and great grandchild. Vina had many hobbies she loved. Vina and her husband were incredible dancers as they would frequent such places in their earlier years in California as the Palladium, downtown Hollywood in LA, or they’d go to Long Beach, or to Venice, CA where all the name bands and orchestras played in their days as they would swing dance the night away. Mom said those were great times for them! Vina was a wonderful canvas painter and painted many paintings for her children as well as for churches. Later in life, she was very active with a strong Christian Ladies group in California called the Woman’s Aglow. Mom also did lots of public speaking at meetings as she was a School Board member at the school where one of her children went to high school. Vina and her husband loved exploring the beautiful mountains of New Mexico. Their most relaxing day of the week was Sunday when she and her husband read the Sunday paper overlooking the views of Elephant Butte Lake. Vina also loved to sing in her church choir and to sing solos. Often, she would sing hymns and praises to the Lord in Spanish. She loved to praise the Lord through music, but most of all, Vina loved praying and telling others about Jesus. Mom has left her children, family, and friends with the greatest legacy anyone could ever leave. She left us her legacy of her Christian faith and the remembrance to be always mindful to live life to the fullest with faith and trust in our Lord! She loved life, loved her husband, her children, and all her grandchildren, and above all—she was a lover of the Lord her God and she knew what it meant to be a prayer warrior for those she loved and met. She always wore a “smile” on her face that welcomed and invited those around her to feel comfortable and at peace. Mom, you will be so greatly missed, but with confidence we know we will see you and Dad again soon (1 Thessalonians 4:17). Today, Liduvina Marie Quintana Lozano has joined those she loved dearly as they are now awaiting us in the Presence of the Lord. Mom’s favorite verse, “...I will be with you; I will never leave you or forsake you” (Joshua 1:5c). Survivors include Henry, Jr. & Paulette Lozano of California; Robert & Marla Lozano of California; Jamie & her son Gage of TorC; and Ray & Kris Lozano of California. She was blessed with her 12/Grandchildren - Gary, Paul, Autumn, Brittney, Jothum, Cassie, Rainee, Isaac, Angela, Gage, David and Brooke; and 14/Great-Grandchildren - Maya, Garret, Meriah, Jothum Jr., Salinda, Sevonna, Rebecca, Gage, Haile, Aliyus, Scarlet, Devonte, Jada, Jovanni; and 1/Great-Great Grandchild-Kingston. Cremation has taken place and a private Memorial Service will be held.